The Chorley ace may now earn himself a shot at the British title against Tyrone Nurse. The slick southpaw dominated for large spells of a gripping encounter against a rough and ready Hughes. Ultimately, undefeated Catterall’s class showed as he took a deserved unanimous decision with scores of 115-113, 117-112 and 117-113. The classy Catterall proved what a skilled operator he is as he earned a shot at the British title. Backed by a vocal crowd, Catterall made his reach advantage count in a gripping opening round. The Chorley man continued to land punishing left hands as the fight progressed but Hughes continued to soak up the punishment and come back for more. Catterall began to outclass the determined Hughes in the latter rounds. He summoned the energy to land several impressive combos in the closing rounds but Hughes took them well and denied the champion a stoppage win. The 22-year-old now moves on to a perfect record of 13 wins with nine knockouts. “It was a hard-fought victory and I knew Joe was going to come prepared,” Catterall said. “I watched his fights and I knew he was a tough customer – but I got the job done. 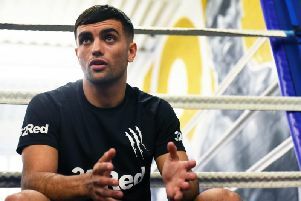 “I’m going on holiday next week but I would be happy to cancel it if I could fight on July 9 for the Tyson Fury versus Wladimir Klitschko bill.